James Martin’s version of this takeaway favourite is fast, easy, uses up your leftovers and goes easy on the washing up. Heat a wok or large frying pan until it is very hot. Add the garlic and ginger and cook briefly, stirring all the time. Add the COLD rice and seasoning and stir fry for about 5 minutes on a high heat. Beat the eggs together and add the mixture to the pan. Stir fry until the eggs have set. 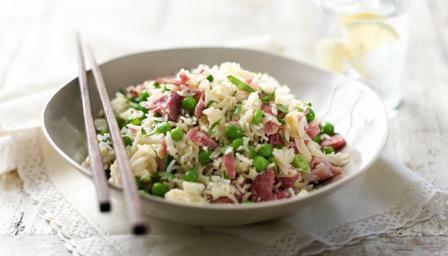 Add the peas, ham, chicken or prawns to the rice. At the end of cooking mix in the coriander. Transfer to a warm dish and serve hot or cool as a rice salad.